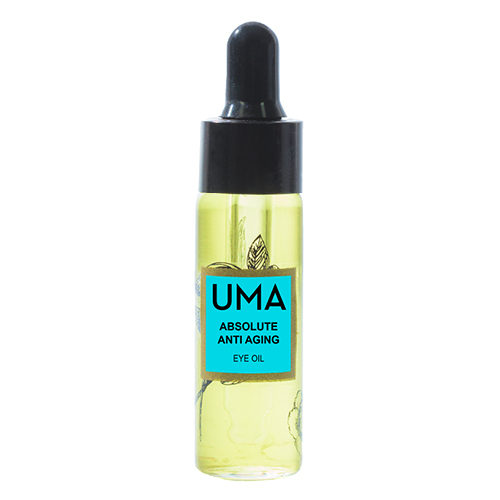 The Absolute Anti Aging Eye Oil by UMA Oils harnesses the power of an ancient family recipe to deliver a look of youthful rejuvenation to the delicate skin around the eye area. All of the botanicals used in this time-honored formula are sourced straight from the UMA family farm which ensures maximum potency and purity. Organic sandalwood, rose, clary sage, rosehip, pomegranate, frankincense and chamomile are just a few of the powerful essential oils in this blend. Together they work to diminish signs of puffiness and environmental stress for an invigorated and brighter appearance to the skin around the eyes. This concentrated eye serum can be used day or night. It is oil based, so for some, it may not work directly under makeup. Tip: Add a drop to concealer before applying. We've found this oil-based eye serum works best as a superb overnight eye treatment. Apply 2 drops to fingertips each evening to the delicate area around the eyes and gently tap and allow to absorb.